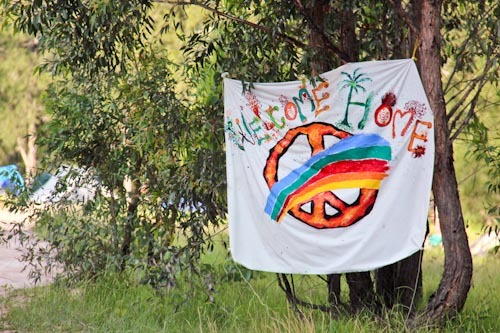 We’re delighted to be participating in our first gathering of the Australian Rainbow Family this month. 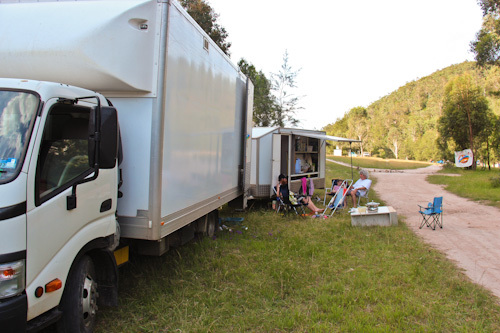 We’ve long desired to be part of a communal camp gathering, and today we reached the land at Glendon Brook where people from all over Australia and the world have come together for a couple of weeks of tribal living. After leaving Beresfield, we stopped in Singleton for fresh food supplies as we don’t know how long it will be before we’re back in town. Then, following instructions distributed by email, we followed the road to Glendon Brook, passing Cranky Corner first before finding the right driveway. This gathering is on private property, something of an anomaly. Usually Rainbow Gatherings are held on public land — national parks, state forests or reserves. 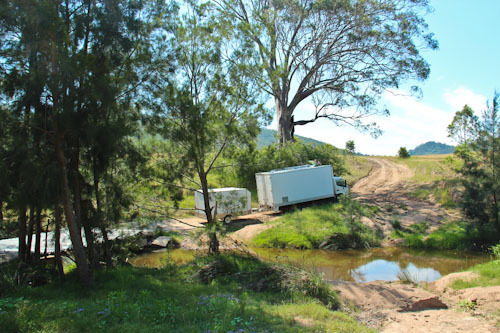 However, through a series of circumstances, previous locations were deemed unsuitable, and local landowner Lloyd offered his place to the Rainbow Family for the six-week-long gathering. To get to the Rainbow Gathering, we had to cross over a clickety-clackety home-made bridge over Glendon Brook. This is about as rough a road as we can take the truck and trailer, and we're thrilled that we could make it safely to the other side and up the steep bank! When we reached the main area, we were a bit confused by the vague signage. We also didn’t know that vehicular-camping was contained to another area away from the main gathering. So we drove boldly into camp and were soon asked to park rather than keep driving through the car-free zone. "Welcome home!" is used to greet newcomers to the gathering. As people are entering the camp-site as "family" returning to a tribal gathering, we treat each other as brothers and sisters. As we walked about camp, we’ve noticed that almost everyone else has set up tents close to the creek. People are swimming in the water, sitting around in circles talking or just relaxing in hammocks in the shade. We greet others with hugs and after a while stop trying to remember everyone’s names. There are a number of other families with children, and we’re parked close to them, so that looks promising. We’ve checked out the creek. Most of it is pretty rocky, but there are a few nice places to swim and a couple of sandy, beachy spots with many trees providing shade on the banks and in the water. Prior to arriving at the Rainbow Gathering, we only know one other person attending. We met Ela at the unschooling retreat in Tallebudgera last year, and it is through her that we’ve learned of the Rainbow Gathering. Ela is also a midwife, so I feel like I need to check in with her — although I haven’t arranged to use her services. She’s in a tipi down near where the creek curves a corner, and I discover that there are a number of communal tent spaces set up for people to congregate in. One is called the Chai Space, and it has a fire-pit for cooking chappati and chai. Another is set up as a place where people without tents can sleep on their bedrolls. We're parked alongside the main road in and out of the Rainbow Gathering, a perfect location for getting to know everyone who walks in and out of camp! When David and I were camped at Flat Rock last month, I expressed a desire to find a nice place in the bush to camp for a couple of weeks. This looks like a good place to be — and staying among like-minded people is a bonus! We’re happy to be here, happy to be welcomed home. wow, so that’s where you’ve been! I am sooooo envious. Our time will come though and our bus is nearly ready to pick up. yeeee haaaa !!!!!! Love you all, hopefully see you soon. Was so awesome to meet you again, and congrats!